Uber is selling its money-losing auto-leasing business to Fair.com, a startup that’s trying to upend the auto-leasing industry. The sale price isn’t known but the deal includes Uber taking a stake in Fair.com. Partnerships like this one are quickly becoming a cornerstone of the management style of Uber’s new CEO Dara Khosrowshahi. Uber is selling its money-losing auto-leasing business to the startup Fair.com, unnamed sources have told The Wall Street Journal. Fair is a car marketplace cofounded by industry vets Scott Painter, the former CEO of TrueCar, and Georg Bauer, the former VP of finance at Tesla and BMW. Fair is trying to change the car-leasing industry by allowing people to lease cars based on how much money they are willing, and qualified, to spend, and then letting them return the car anytime they want with five days notice. Everything from the approval process to the car shopping to the payments is done through an app. The Journal didn’t know how much Fair may have spent to acquire Uber’s leasing unit. Uber declined to comment to Business Insider on the deal. At the time of the sale, Uber had about 30,000 cars in the program worth about $US400 million, the Journal reports. But, as part of the deal, Uber will take a stake in Fair and the startup will become an exclusive partner with Uber, offering drivers the ability to lease cars. Fair will also employ 150 people out of the Uber unit that once employed 500. This kind of partnership is quickly becoming a cornerstone of Uber under its new CEO Dara Khosrowshahi, who became CEO in August after a serious of scandals forced CEO Travis Kalanick to resign in June. 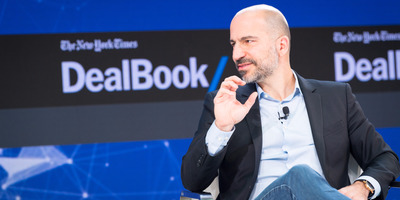 Uber hired former Asian Goldman Sachs exec Brooks Entwistle in August and, under Khosrowshahi, he has been busy striking partnership deals with taxi companies throughout Asia to allows riders to book taxis through the Uber app. And earlier this month, Uber struck a $US474 million joint-partnership deal with taxi company ComfortDelGro in Singapore that sold a 51 per cent stake in Uber’s car leasing subsidiary in that country to ComfortDelGro. These deals mark a major shift of Uber’s attitude toward taxi companies, at least in that part of the world, attempting to view them as potential partners instead of as arch enemies. Uber has been looking for a buyer since it decided to close the unit down in August. The company never expected to make money on the program, it said, but it was losing far more money than anticipated. It expected to lose about $US500 per car but was losing about $US9,000 per car, according to The Wall Street Journal. Drivers leased the cars, with the payment deducted from their earnings, and were allowed to return them easily. But to make a living with these cars and pay for them, they drove the cars hard and often returned them in poor condition. Uber has been trying to clean up its balance sheet after losing about $US2.52 billion in the last two quarters as it marches toward a potential 2019 IPO. With this deal, Fair cements its place as startup to watch, too. It attempted to acquire Beepi last year, a startup that raised $US150 million for an exclusively online used-car marketplace, but the sale fell through and Beepi was shut down. In October,Fair said it raised over $US1 billion between venture investment and loans. Investors include BMW’s iVentures, Penske Automotive Group, and Mercedes Benz.